With the two Koreas in a peace mood, the Korea Institute of Design Promotion is considering ways to use design to support better inter-Korean ties. Eune Ju-hyun, KIDP president and CEO, revealed a plan to enhance inter-Korean cooperation -- if the right opportunity were to present itself -- at a press conference in central Seoul on Tuesday. The press conference was held to mark 90 days in office for Eune. 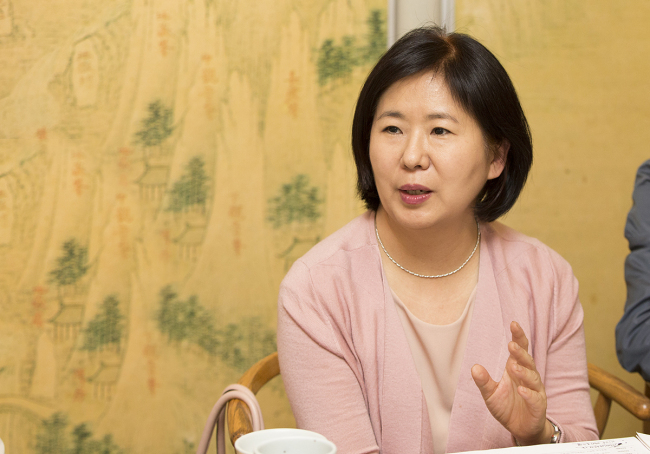 A former Seoul National University professor specializing in user experience design, Eune is the youngest and first woman to be appointed to the post. The plan, currently only at its conceptual stage, is likely to help small and medium-sized South Korean enterprises and promote the importance of design to North Koreans. Before its shutdown, labor-intensive South Korean businesses operated at the factory park, making use of North Korea’s cheap labor. “Not much is known about what the design industry is like in North Korea. But considering the level of products and the fact that design is usually used for government propaganda, the industry is suspected to be at a low level,” an official from the institute said. Founded in 1970, the KIDP works on strengthening the competitiveness of the Korean design industry and promoting design to improve the quality of life.